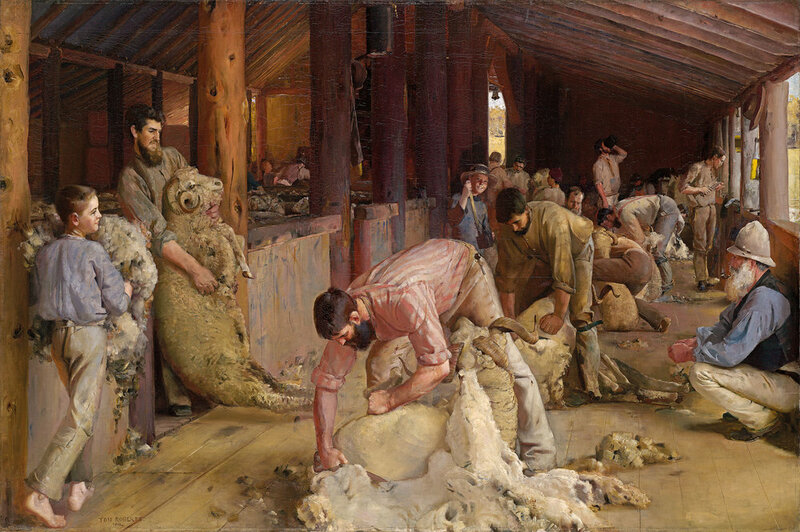 Tom Roberts Shearing the rams 1890. Oil on canvas on composition board, 122.4 x 183.3 cm; 170 x 230.4 x 9.5 cm (framed). National Gallery of Victoria, Melbourne. Felton Bequest, 1932. Shearing the rams hangs alongside AGWA’s own Down on his luck by Frederick McCubbin, and gives you a rare opportunity to see these two great nationalistic narrative paintings side-by-side. Both works take rural subject matter as the starting point for their images of Australian identity, but Roberts presents a positive vision of the pastoral industry, far removed from McCubbin’s image of a struggling pioneer. Roberts based his painting on sketches made in a shearing shed in country New South Wales. The close observation of details and atmospheric effects, together with the sense of this being a snapshot of a fleeting moment, gives the painting an aura of ‘truth’, which has helped to secure its popularity for many generations. It is a great example of Roberts’ statement that if art is “the perfect expression of one time and place, it becomes art for all time and of all places”.